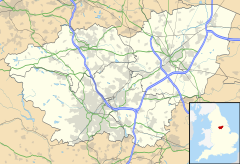 Mexborough is a town in the Metropolitan Borough of Doncaster in South Yorkshire, England. It lies on the estuary of the River Dearne, on the A6023 road, between Manvers and Denaby Main. Historically part of the West Riding of Yorkshire, Mexborough has a population of 14,750, increasing to a ward population of 15,244 at the 2011 Census. The name Mexborough combines the Old English suffix burh meaning a fortified place with an Old English or Old Norse personal name, which may be Meke, Muik, Meoc, or Mjukr. Mexborough is located at the north eastern end of a dyke known as the Roman Ridge that is thought to have been constructed either by the Brigantian tribes in the 1st century AD, perhaps as a defence against the Roman invasion of Britain, or after the 5th century to defend the British kingdom of Elmet from the Angles. The earliest known written reference to Mexborough is found in the Domesday Book of 1086 (Mechesburg), which states that before the Norman Conquest of England the area had been controlled by the Saxon lords Wulfheah and Ulfkil. Following the Conquest the area fell under the control of the Norman Baron Roger de Busli. The remains of an earthwork in Castle Park are thought to have been a motte and bailey castle constructed in the 11th century shortly after the Conquest. St. John the Baptist C of E church includes elements that date from the 12th century. A few other pre-1800 buildings remain, including several public houses: the Ferryboat Inn, the George and Dragon, the Bull's Head and the Red Lion. Most of the buildings in the town are post-1800. Throughout the 18th, 19th and much of the 20th century the town's economy was based around coal mining, quarrying, brickworks and the production of ceramics, and it soon became a busy railway junction. These industries led to an increase in industrial illness and an increase in the mortality rate. Although the town boasted a cottage hospital, the lack of suitable facilities led to Lord Montagu donating land for a new hospital to be built. Lord Montagu laid the first stone at the site in 1904. The site is still a working hospital, and now forms part of the Doncaster and Bassetlaw NHS trust. The industries which led to the creation of Montagu Hospital not only brought problems to the town, but also led to an increase in population and, for some, an increase in wealth and opportunity. Many more public houses and other businesses were created, many of which are still trading today. It was in one of these public houses, the Montagu Arms, that Stan Laurel stayed overnight after performing at the town's Prince of Wales Theatre on 9 December 1907. During the second half of the 19th century, like many other industrial towns, a Cooperative Society was formed in Mexborough. This was modelled on the consumer cooperative set up by the Rochdale Pioneers in 1844. In 1861 nine working men met together at the home of James Simpson in Mexborough and decided to form the Mexborough Working Men's Industrial Society (later renamed as the Mexborough Cooperative Society). The aim of the Society was to supply (at first to the nine men themselves) the necessary things of life. Membership quickly grew and by the 1890s it stood at 1,200. In its heyday, there were ten shops which were to be found in every built up area of Mexborough. By 1903 land had been purchased in the middle of Mexborough on which to build a large and grand new central store, but then suddenly in 1904 the Mexborough Cooperative Society went into liquidation. Soon after they were taken over by the Barnsley British Co-operative Society. One of Mexborough's landmarks is closely associated with the Cooperative Society. This is the former Barnsley British Cooperative Society flour mill which stands on the north side of the River Don Navigation close to the Church of St John the Baptist. It started off as the "Don Roller Mills". It was owned by James White who sold it to the Barnsley British Cooperative Society in 1912. For over a hundred years, the railway locomotive maintenance and stabling depot (colloquially known as "Mexborough Loco") was a major employer. The South Yorkshire, Doncaster and Goole Railway arrived in Mexborough in 1850. The extensive coal traffic generated by the local collieries required railway locomotives to haul them and these locomotives required driving, firing, refuelling, maintenance and stabling. Mexborough was chosen as the site for a large 15-road depot. In its heyday, it had an allocation of about 150 locomotives. In the 1920s it was the stabling point for the LNER Garratt, then the most powerful locomotive in the UK. The depot closed in 1964. Following the demise of the coal mining industry in the 1980s Mexborough, like many ex-mining towns and villages, is still in the process of economic and social recovery. The Rock Pottery, it is believed, traded during its early years as Beevers & Ford. In 1839 it was purchased by James Reed, who was succeeded ten years later in 1849 by his son John. Reed junior changed the name of the business to the "Mexborough Pottery" and the pottery was extended still further and more kilns constructed. When the Rockingham Pottery closed John Reed bought most of its moulds and produced many items from them, but with differing transfer prints and also plain green with raised leaf design impressed simply with "Reed". Before 2010 Mexborough was in the Barnsley East and Mexborough constituency. Since then it has been in the Doncaster North constituency, whose current MP is Ed Miliband, former leader of the Labour Party. Local party Mexborough First currently holds all three seats in the Mexborough ward on Doncaster Metropolitan Borough Council. The town is served by Mexborough railway station for trains going towards Doncaster and Sheffield. Mexborough also has a bus station. Mexborough has one secondary school (Laurel Academy) and many primary schools. Mexborough has been represented in the FA Cup by no fewer than four different football teams - Mexborough Locomotive Works, Mexborough St. Johns, Mexborough West End and Mexborough Town. The last of the four was the most prominent and won the Yorkshire Football League in 1973. Steve Goulding – professional footballer, played for Sheffield United during the '70s. Died 1985 aged 31. Wikimedia Commons has media related to Mexborough. ^ "Doncaster MBC ward population 2011". Neighbourhood Statistics. Office for National Statistics. Retrieved 30 March 2016. ^ Goodall, Armitage C. (1913). "Masborough, Mexborough". Place-Names of South-West Yorkshire; that is, of so much of the West Riding as lies south of the Aire from Keighley onwards. Cambridge: University Press. p. 209. ^ "Mexborough". A Key to English Place-Names. Institute for Name-Studies. Retrieved 23 November 2008. ^ Boldrini, Nicholas (1999). "Creating space: a re-examination of the Roman Ridge". Transactions of the Hunter Archaeological Society. 20: 24–30. ISSN 0966-2251. ^ Armitage, Ella Sophia (1905). "Chapter III: Camps and Earthworks". A key to English antiquities : with special reference to the Sheffield and Rotherham District. London: J.M. Dent. ^ Williams, Ann; Martin, G.H., eds. (1992). Domesday Book, a Complete Translation. London: Penguin Books Ltd. p. 828. ISBN 0-14-143994-7. ^ Armitage, Ella Sophia (1905). "Chapter V: Moated Hillocks". A key to English antiquities : with special reference to the Sheffield and Rotherham District. London: J.M. Dent. ^ Historic England. "Church of St. John the Baptist (334556)". Images of England. Retrieved 23 November 2008. ^ "Newsletter 26 November 1996". Mexborough & District Heritage Society. Retrieved 8 August 2015. ^ "Yorkshire Giant of the Cooperative Movement". Yorkshire Post. Retrieved 18 July 2015. ^ "Don Roller Mills". Mexborough & District Heritage Society. Retrieved 18 July 2015. ^ "The Potteries of Mexborough and District". Retrieved 30 March 2016. ^ "RESULT: Local Election Doncaster". Sheffield Star. 8 May 2015. Retrieved 23 September 2015. ^ "Lionel Smith". England Football Online. 8 July 2016. Retrieved 5 July 2017.